*Received physical copy from publisher in exchange of an honest review. Let me just say that I glimpsed this one on Goodreads a few weeks ago and mentioned it in a WoW post because I was intrigued by the plot. So yeah, I was definitely anticipating it and thankfully, it was what I'd expected it to be: intense. 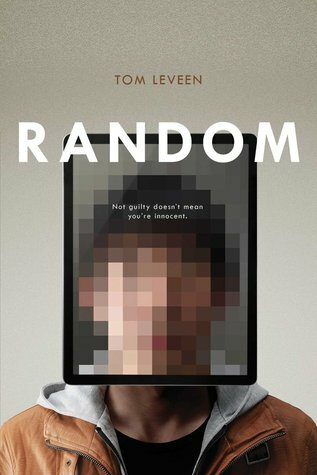 Random is a good depiction of how a teen becomes a bully, even though she's not quite aware of the fact that she did turn out to be one. And trust me, Tori is not your average sweet and innocent protagonist. She's quite a trip. I can see a lot of readers not liking her character because of her conceited thoughts and some of the things she'd say, but I believe that's the intention the author was going for and it worked. Tori is selfish. Her part in what happened was just sad. But regardless of it all, she still didn't have a full grasp of how even though she didn't actually kill her friend, she did help in driving him over the edge. At first when she received that random phone call, I was like, no, something's fishy here. But then once Andy began talking he really convinced me that he was on the verge of committing suicide, and I was curious as to how this obviously selfish girl who was on trial for her part in another suicide would help Andy change his mind. I think that, in trying to keep him alive, I got to learn something about Tori. She wasn't as bad as I'd initially thought and had clearly done something stupid just to fit in with a crowd she considered cool. It took most of the book for her to realize that and I wanted to slap the hell out of her so many times. And to be honest, when the whole thing with Andy was unraveled, I wasn't sorry for her. She needed the wake up and I don't blame Andy and the others for doing that. She sort of snapped back to her old self. Like I said, not a lot of people can stomach Tori as a main character, but it worked for me. I see the purpose of the story and what the author is trying to accomplish. And I think he did a great job in emphasizing his intentions. I read Random in one sitting because it was really fast-paced and the writing was good. It pulled me in greatly. I was invested in the story from start to finish. It was different for me, seeing the perspective of a "bully" and the reaction of everyone after a bullied teen had taken his life. It's not often you get this side of the story and I'm glad I gave Random a chance. It was a great story, to me. I liked that the character was flawed, but I'm also happy that she experienced growth, or more like returned to her true self--to the person her brother, best friend, and parents can be proud of. She may not be able to change what happened, but at least she recognizes her part in it and can genuinely say that she's apologetic. There was more going on aside from the main topic of bullying, but I don't want to spoil it for you. I can only say that this is a good story for those looking for something realistic and intense to read. I highly recommend. Tom Leveen has 22 years of theatre experience as an actor and director. He was the Artistic Director and a co-founder of two companies: Chyro Arts Venue, an all-ages nonprofit visual and performing venue; and Is What It Is Theatre, a community theatre that operated for 13 seasons. Tom lives with is wife and son in the Phoenix area. PARTY was his first novel, followed by ZERO (a 2013 YALSA Best Book) and MANICPIXIEDREAMGIRL, all with Random House. His fourth novel, SICK, a YA horror, will be released in Fall 2013 from Abrams/Amulet. Hope you like the story when you get a chance to read it. Oh my goodness, Shane! The blurb alone gave me goosebumps! I need this book :) Thanks for your awesome review! Thanks, Lex. I really hope you like the story too when you get a chance to read it. The synopsis is interesting but your review has me sold. I'll have to give this one a read. Matt @ JC's Book Haven. This sounds really intense! I'm happy you enjoyed it. Thanks, Amber. I hope you read it too. I think this would be much too intense for me to read! However, I do applaud the author for writing this, since it will help raise consciousness as to the great harm bullying of any type does to the victim. I have never been able to understand WHY anyone would bully another person. There are people -- especially kids and teens -- who somehow get pulled into doing this in order to fit in with "the cool crowd", as Tori was in this novel. However, there are adults who engage in this type of behavior just because they're sadistic and cruel, and simply don't care that they're hurting another person. Again, I don't understand this. If someone were to tell me that something I was saying or doing was hurting them, I would immediately do two things: 1.) stop the words and/or behavior, 2.) sincerely apologize. I'm always VERY careful not to hurt people's feelings in any way. But I'm human, so I can slip up. That's where numbers 1 and 2 above come in. Nicely said. I think a lot of people lack those logic. Thanks for your comment.